A polypent is a figure made of regular pentagons joined edge to edge. Here I show all the polypents of order up through 6. Free polypents are classified by congruence, with no cell used as a base. Two-sided polypents may be rotated and reflected. One-sided polypents may be rotated but not reflected. Matthias Koch and Sascha Kurz have since enumerated polypents up through order 16. 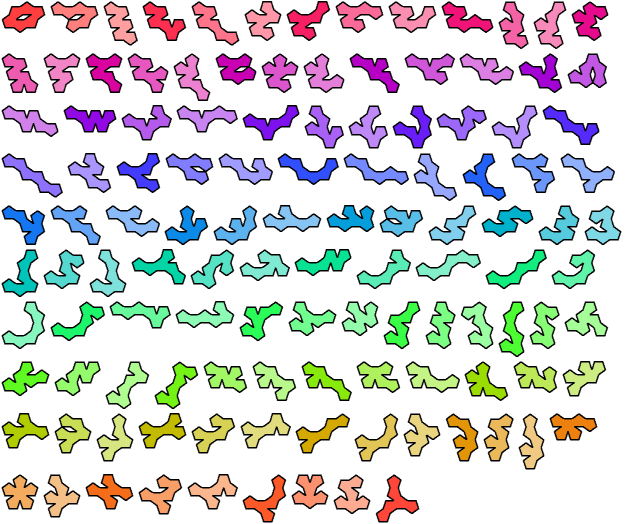 You may see some of their results at Professor Kurz's Generalized Polyomino Enumeration Page. 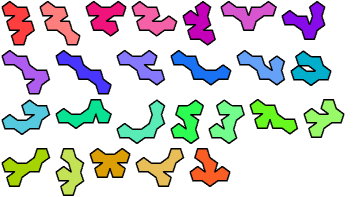 The enumeration for free polypents is A103465 in the On-Line Encyclopedia of Integer Sequences. The figures below show two-sided polypents.